The United States has effectively closed its doors on Huawei and ZTE, two of China's biggest tech companies. That's left many to wonder: Will big names like Alibaba, Tencent and Lenovo be next? "If things continue as they have been, all bets are off," said Samm Sacks, a senior fellow in the Technology Policy Program at the Center for Strategic and International Studies. Since March, tensions over trade have been rising between Washington and Beijing. 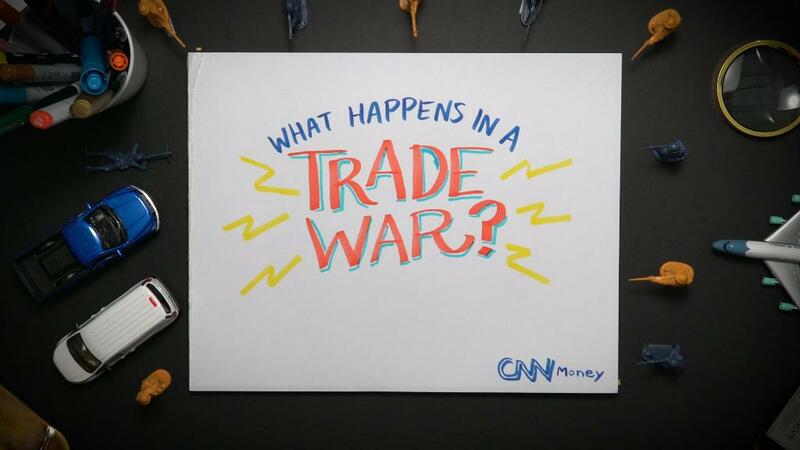 The US slapped tariffs on steel and aluminum imports, and Trump has called for up to $150 billion in additional tariffs on Chinese goods as punishment for intellectual property theft. Then, the US Commerce Department last week banned ZTE (ZTCOF), which sells smartphones and other telecommunications equipment around the world, from buying product components from American firms for seven years. The agency said that ZTE lied to American officials about punishing employees who violated US sanctions against North Korea and Iran. The US government has also sought to curb Huawei, China's biggest telecom equipment company. Top officials from the CIA, NSA and FBI in February said that American citizens shouldn't use Huawei phones. In March, Trump killed Broadcom's proposed $117 billion takeover of Qualcomm amid concerns that the deal would give Huawei an edge in the race to develop 5G technology. Huawei has denied that its equipment poses specific security risks. ZTE has called the US ban "extremely unfair." Now it's an open question whether the US will turn its attention to other Chinese firms — like Alibaba, which has been working to grow its US presence, and Tencent, which has been pushing its online payment service, WeChat Pay. The US may have taken its tough stance on ZTE in part to send a message to these powerful companies, said Handel Jones, the CEO of high-tech consultancy International Business Strategies. "The Chinese have a saying: 'Kill the chicken to scare the monkey,'" he said. In addition to proposing tariffs for IP violations on China, Trump instructed the Treasury Department in March to look into new restrictions on Chinese investment in sensitive industries. Separately, the Trump administration is said to be weighing retaliation for Chinese policies on cloud computing, and might impose its own limitations on Chinese cloud services providers in response. Such moves could pose big problems for companies like Alibaba and Tencent. Foreign investment has been a big part of both companies' strategies for expanding into the United States. Tencent has purchased stakes in a number of US companies, including Snap (SNAP) and Tesla (TSLA). Ant Financial, an Alibaba affiliate, tried to buy money transfer service MoneyGram in 2017, but had to drop the deal earlier this year because of opposition from US regulators. Alibaba and Tencent also operate cloud services businesses that compete with Amazon (AMZN), Google (GOOG) and Microsoft (MSFT). The US market is important for both companies — and constraints would seriously hamper growth. "It would basically kill their business in the US," said Paul Triolo, who specializes in global technology policy at Eurasia Group. Then there are Chinese tech companies that have similar profiles to ZTE and Huawei, such as computer maker Lenovo. Lenovo hasn't been caught up in the US-China trade fight thus far. But it could be grouped with ZTE and Huawei, and viewed as a potential security risk, according to a report for the US-China Economic and Security Review Commission published last week. The company, which is partially state-owned, has US headquarters in North Carolina and has worked to build its global credentials. But Lenovo has also "been linked to Chinese state-led cyberespionage efforts," according to the report, which was prepared by Interos Solutions, a consultancy that studies supply chain risk management. And Lenovo's founder and CEO have connections to the Chinese military, the group said. Additionally, Lenovo was caught shipping laptops to the US with pre-installed malware beginning in 2014, and had to reach a settlement with the Federal Trade Commission in 2017. "Even companies that have been ... working with US partners in purely commercial relationships, they're still going to be vulnerable to getting caught up in broader US actions," CSIS' Sacks said. Lenovo said in a statement it is currently reviewing the report and plans to meet directly with the committee and Interos Solutions to discuss "numerous inaccuracies." "Lenovo respects the laws and regulations of the countries where we do business," the company said. "As a global, publicly traded, Fortune 500 company, we adhere to the highest standards of corporate governance and compliance, and our industry-leading supply chain certification program ensures we meet those same stringent requirements in each of the over 160 countries where we operate."